Other versions: PC; X360; PS3. I write this during a brief window between sessions where the most wise, wondrous and bountiful Bejeweled 3 has been kind enough to allow me a few minutes to myself. You see, despite mercilessly kidnapping all my gaming time, it rests calmly in my DS, knowing I won’t be able to resist for long. A million years ago, I used to play other games. I enjoyed a seemingly healthy, varied gaming diet. Then Bejeweled 3 happened. It’s compulsive, brain-ruiningly addictive, and these aren’t the fresh symptoms of finding a neat new game either; it’s had me like this for months. Griptonite Games back up their nifty portable spin-off Assassin’s Creed II: Discovery with a truly amazing DS outing that marks the best version of the best puzzler of the 21st Century. A game so good, it leaves the entirely respectable Bejeweled Twist (its DS predecessor) floundering ponderously in its wake, B3 is match-three puzzling made in gaming heaven. …It’s like, how much more addictive could this be? And the answer is none. None more addictive. The drive to improve, learn new tactics, sharpen your senses and reflexes – it goes way beyond anything any brain-training games have been able to muster, because such unbridled enjoyment and moreishness make it a necessity. And that’s part of the beauty of Bejeweled 3; it’s entirely compelling whether you’ve been playing video games for twenty years or twenty minutes, the fundamental appeal remains every bit as magnetic. Whereas Tetris tested organisation and spatial awareness, Bejeweled 3 is a test of instinct and reaction. It helps of course that it’s been given the perfect environment to flourish in, and given Tetris’s memorable Game Boy outing, it’s perhaps fitting that Bejeweled 3 is also at its best in portable form. The stylus control couldn’t be better; not only hyper-responsive, but unerringly accurate given the large number of jewels that populate the touch screen in tight formation. Lightning mode (adapted from Bejeweled Blitz and therefore familiar to fans of the series), which sees you matching jewels at speed in a desperate attempt to amass enough time to continue on after the initial sixty seconds has elapsed, is a work of puzzle gaming art. The first time you pass half a million points, it feels like breaking down a great barrier. But as with the best puzzlers, improvements soon make such efforts feel like small potatoes, and your supposed ‘high’ score will never be enough. One million points, two million, three. Before you realised what’s happened, Bejeweled 3 has you entrenched in a scoring pilgrimage that demands of the player their absolute tip-top sharpness for increasingly long periods as you head towards five, six million points and beyond. Scores reach ever-more Herculean standards, yet you never feel an improvement is out of reach, the allure of the game somehow convincing you that next massive tally is waiting just around the corner. For those who bemoan modern games for not dragging the absolute most out of their players, it’s ironic that a puzzler perceived as casual-friendly makes one of the most compelling cases against this. There’s an excellent complement of modes too, which develop their own nuances that become appreciable with extended play. Butterflies is a good example of this; the task here is to match butterflies to their corresponding coloured jewels before any the top of the screen, as after every move, they each ascend one row. Like Poker, there’s no break-neck pace here; it’s all about thinking ahead and pre-empting ways of taking out multiple butterflies and staying ahead of the game. It’s marvellously clever and ultimately very moreish. Ditto Diamond Mine, which has the players matching jewels and descending through a neverending rock pile somewhat reminiscent of the ones Mr Driller used to tackle. Ice Storm is perhaps minutely weaker than the other setups, as it’s a tricky one to develop a game plan for. Essentially, you’ve just got to go mad and hope you can match enough jewels across the breadth of the board in the hope of keeping ice pillars at bay for as long as you can. Unless you’re very good, this mode tends to be over within a couple of minutes. These gift the game stunning longevity, and there’s a Quest mode just to add icing to the cake. This offers a mix of standalone challenges based on the all of the above game variants, as well as the odd devious one thrown in (clearing 150 jewels in 20 moves) for good measure. Though not as compelling as chasing scores, Quest is gauged to offer a fairly meaty challenge that’s ideal for bite-sized, on-the-go sessions. Though a tertiary concern with such games, Bejeweled 3 looks decent by DS puzzler standards, where colours and clarity are the name of the game. There’s little in the way of visual pyrotechnics or stylish presentation, but the main heart of things, the jewel board, looks vibrant and (bar the occasional mix-up caused by orange/red time bonuses and orange/yellow butterflies) clear. The front-end could do with some work though; it’s not that it’s cheap looking exactly, but the high-score boards and Quest menus deserve something a little less beige, as it stands in brash contrast to the precise, polished perfection of the gameplay itself. The BMGs are a pleasant surprise, as each mode offers a different selection of accessible jingles, with a soundtrack that’s considerably more far-reaching than puzzlers are typically known for being. It’s just a shame you can’t pick and choose, as you’ll be hearing the Lightning theme rather more than you can stand. But never mind any of that. 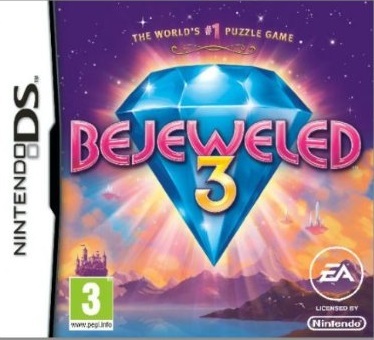 Bejeweled 3 breaths life in to the DS puzzle scene by matching perfectly one of the most addictive puzzlers there has ever been with a control system that’s considerably more direct, enjoyable and effective to use than its PC equivalents. An excellent variety of game modes, satisfying and endlessly addictive gameplay, Bejeweled 3 is all you could ever reasonably ask for of a portable puzzler. Uh-oh. I can hear it beckoning me again, so in case I’m never seen in public again: buy it.